Go watch Anthony Bourdain's episode titled "Heartland." He came to Columbus -- and made some solid observations. Namely Kihachi (the gourmet Japanese chef's meal/small plate smörgåsbord)and now, Clever Crow Pizza are relatively unknown but essential components in Columbus foodie culture. The mackeral liver at Kihachi is proof enough we have some gems here. Another segment in that episode claims Austin, Texas as the food cart capital of the U.S. Seasonally it is an ideal location for the food cart culture -- and furthering that truth I've sampled many of the carts there in my years. Ground zero for Taco Trucks, Korean Tex-Mex, one dedicated entirely to duck, Kebabalicious, the cupcake place, anything BBQ, and worthwhile NY style slices everywhere. Yeah, we should be jealous of Austin. Yes. Pork Belly in a sweet, delicate crepe. It works. 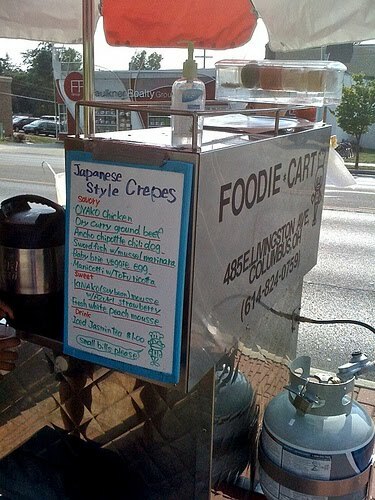 Bourdain would be proud/dumbfounded that this existed on a High Street sidewalk. I've yet to try the dessert crepes but they boast a pretty mean Banana Cream Crepe and the infamous Azuki Stick (?). Any suggestions are welcome. Plus they scoot around all over town, which adds to the reward of obtaining these goodies. Following them on Facebook to find menus and locations is now a rite of passage. Update: just had a craving and seeked them out. Had the very popular Bacon Okonomi Yuki (a recipe with fried soba noodles and a egg) and the Azuki Stick -- which is a sweet red bean paste, similar on my tongue to guava, topped with strawberries and fresh mozzarella cheese. Believe. Will Ice Cube Ever Get His Groove Back?